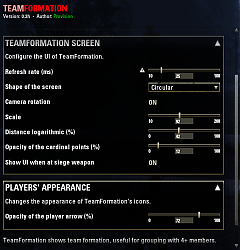 TeamFormation is a user Interface for The Elder Scrolls Online, designed to show the positions and health of your teammates, like a radar. I'm happy to share my addon with you, but please don't make a fork of this addon without my authorization. 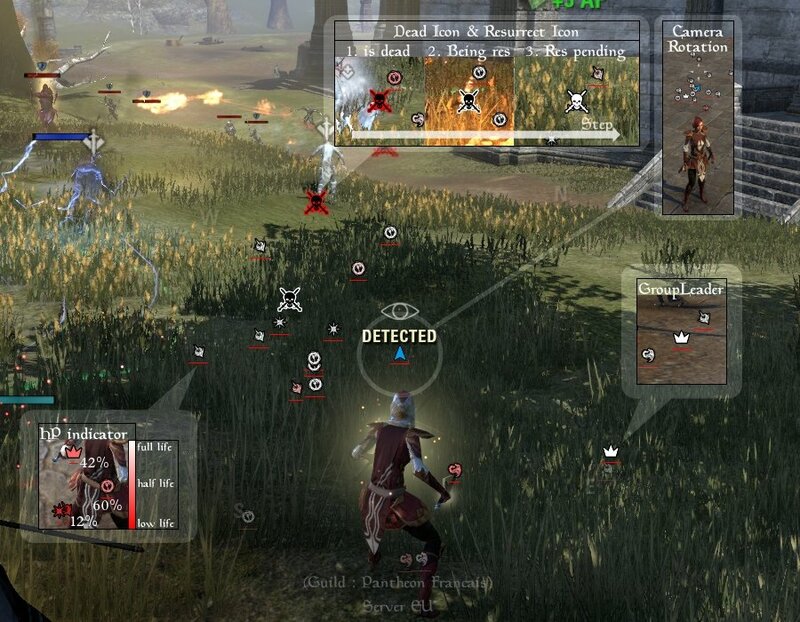 - Healers : See the position of damaged teammates so you can easily heal them. - Leader : See the position of your teammates so you can easily decide what orders to give. - Dps : See the position of teammates so you can stay near them. - Tank : See the position of Healers & Dps who take damage so you can regain agro. - All : See the position of dead teammates and their resurrection status. You can set keyboard shortcuts to disable/enable TeamFormation. - Keyboard shortcut to enable/disable TeamFormation. - Dead and resurrection status icon. - Camera rotation + Character rotation. - Cardinal point (adjustable transparency from 0 to 100%). - Movable, Resizable and Scalable UI. - Group interface shows distance. - /tf : open settings panel. - /tfrainbow : colorate the first ten players. Language : FR, EN, DE. (French is the main support). 1. Download the archive "ProvisionsTeamFormation_vx.x.x.zip". 3. 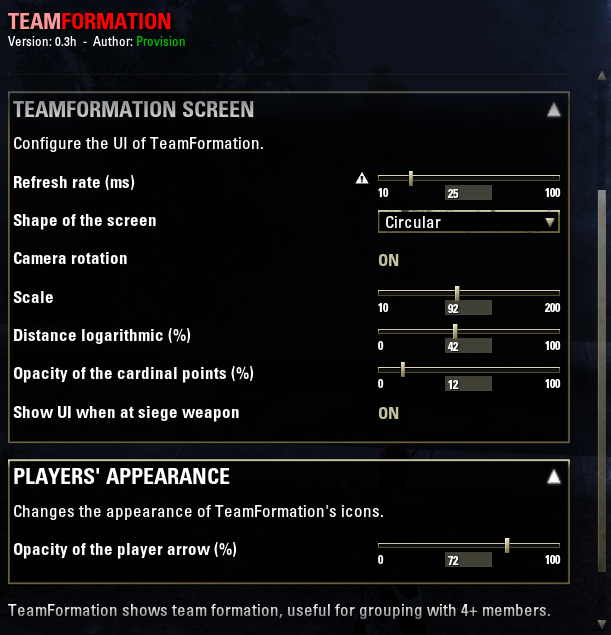 Launch the game, log in, and check that "Prov's TeamFormation" is enabled for your character and then play. 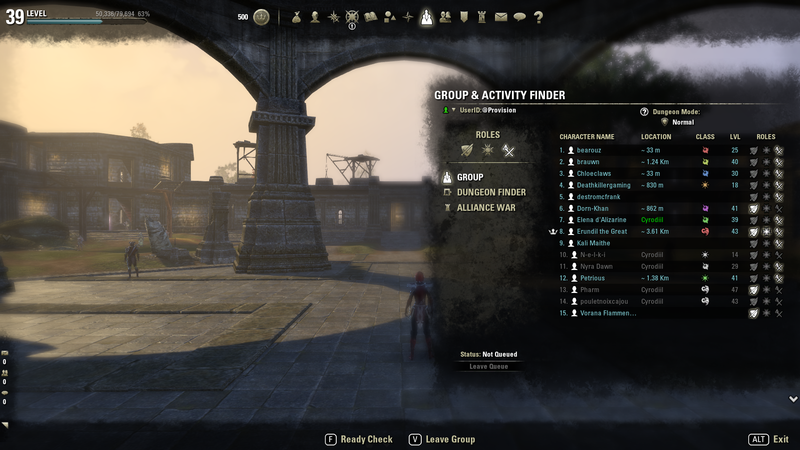 If the UI does not appear it may be because you are not in a group, you need to reload your UI, or you may need restart your game. I looking for German translation, and english checking for correct grammar and spelling of TeamFormation's settings. See this post. One function (< 1% of the code) of this Add-on was inspired by RangeReticle of Adein. - Remove the `libs` folder. - Modify the manifest header. - Update addon number version for Murkmire (4.2). - Fix the bug when a player disconnect. Now, the point diseaspere every time. - Change icon when the teammate is not in the same instance, or the teammate is in building/cavern/other map. - Add support group points (rallypoint & ping teamplayer). - Fix empty unit zone. - Update for new game version (3.2 : Clockwork City & 3.1 : Horns of the Reach). - Update LibAddonMenu r20 to r25. - Update for new game version (3.0 : Morrowind). - Remove "Lock Position" setting. TF doesn't movable with the mouse. - Fix issue when Provision is the first addon who load with LAM2. - Add error handler (and autostop, to prevent infinite error message). - New setting to enable role icon instead of class icon. - Fix and prevent unknown name. - German translation by Baertram. - Fix esc key, and leak to global (thanks Votan). - Fix and Add RGB picker. - Fix issue with color reset button. - Fix draw level (PF is always on background, behind all windows). - Update LibAddonMenu r18 to r20. - When settings panel is open, TF is shown at the right of the setting panel. - (New feature) You can using settings panel "Color customization" in /tf to colorize player icons. - Update number version for v2.4.5. 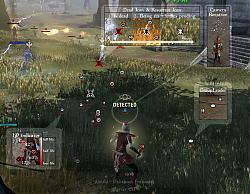 - Update number version for Update 9 (v2.3 Thieves Guild). - Update number version and fix a bug for Update 8 (v2.2.4 Orsinium DLC). - Update number version for Update 7 (v2.1.4 Imperial City Patch). - In group interface ("p" key), you will see distance. - (New setting) You can change the refresh rate (milliseconds). - Fix opacity setting (when this setting = 0). OK, I tried the nuclear option first, as I felt it was warranted. 3. Uninstall via minion (odd that I had to do that, but, whatever). Did you try to delete manually the ProvisionsTeamFormation folder and re-install it ? You can also try to disable all your addOn and run only TF and check if you get this error. You can save your addOn profil with Addon Selector. You can also try a "find in folder" for : "TeamFormation_createLAM2Panel" only ProvisionsTeamFormation folder must be have this function. Last edited by Provision : 12/18/18 at 07:24 AM. Can you use a text editor like Notepad++ or SublimeText3 and say me what do you have in line 66 of "TeamFormation.lua". Last edited by Provision : 12/17/18 at 04:24 AM. If you mean the latest, I've tried that and now I get two separate errors. Does it require another addon? LibStub and LibAddon but my .zip have it. I need more informations on the errors like the full message (screenshot or textplain) to make a fix. In my side, I don't have this issue. Do you use another of my addon ? There is nothing more in the error messages that popup. Copying both of them again to you below. Not using another of your addons. I have libstub (1.0 r5) and libaddonmenu-2.0 (2.0 r26) from other addons. Last edited by Provision : 12/16/18 at 07:10 AM. Last edited by Thrasher : 12/16/18 at 05:35 AM. Try the new version or older. Your error is truncated, i need the full message. Last edited by Provision : 12/16/18 at 05:26 AM. I tried uninstalling and re-installing the addon to no avail. I'm sorry! I made a mistake, I didn't choose the good .zip ! Would it be possible to only have the pointers for healers and tanks showing, so pointers for dd's were hidden? Last edited by Provision : 11/27/18 at 08:01 AM.